Dolakha, Solidarity International accomplished ‘Third RudraMan Scholarship Award’ to the students of Shree Dumsijhang Lower Secondary School of Hawa VDC, a hilly terrain of Dolakha district on December 26, 2015. The scholarship was provided to students who were under poverty and were endured to massive earthquake of April. From lower to secondary level students were provided with stationary materials along with school bag. The event was organized in the presence of President of School Management Committee Mr. Dil Bahadur Karki, School Teachers, Parents and Students. Altogether 73 participants were there in the ceremony. The ceremony mainly dealt with the distribution of RudraMan Scholarship Award (Full Scholarship Includes – Stationary Materials, Bags etc) to 12 students including 10 underprivileged, war affected and marginalized girls of the school and 2 boys who were underprivileged and earthquake affected. The project had also supported 45 students in terms of merit in their education and 47 students were recognized from by observing their Extra Curricular Activities (ECA). In total 124 school going children were benefited by the project. Scholarship and Educational Materials was distributed by the representatives of the organizations to the students in collaboration with other guest of the ceremony. The special guests of the program were Mr. Om Khatri, General Secretary, Mr. Krishna Subedi, Director Global Campaign, Mr. Sagar Sapkota, Director Press Council of Solidarity International. A strong (7.8) earthquake hit Nepal in the area near Barpak, a mountain village between Kathmandu and Pokhara. The earthquake was followed by many powerful aftershocks and a very powerful one (6.7) hit Nepal on Sunday April 26. The earthquake caused extensive damage to buildings and thousands of deaths and injuries. This tremor was also felt in Pakistan, India and Bangladesh. Many historic buildings collapsed, temples have been ruined, and roads are also destroyed. Nearly 9000+ deaths in Nepal and tens of deaths were in India and Tibet. The quake was followed by more than 260 aftershocks. According to seismologist Roger Musson, the standard pattern for aftershocks is that the biggest aftershock will be one day after, and one magnitude less. Thus, the 6.7 magnitude aftershock on 26 April 2015 following the 7.9 magnitude main shock would fit this pattern. It is highly unlikely that the earthquake was a foreshock preceding an even larger earthquake. Therefore, an earthquake larger than 7.9 in the near future after 25 April 2015 is not expected. Anyone can go through this link for list of aftershocks in Nepal. The deplorable news of April 25 is not still rescinded. The feeling of threat is governed by the unbeatable none other than nature. Neither any hypothesis has been proved to eliminate this tremor nor there any pragmatic way to predict. Hence, this type of situation can occur anywhere anytime in this world. So, alertness is a sole solution to eradicate the loss to panic. Every youth organizations along with different NGO and INGOs came up with relief program from the very first day of the quake. The youth clubs appeared more sensitive to this aftermath. They reached with some relief materials to such places where government organization has not been yet. 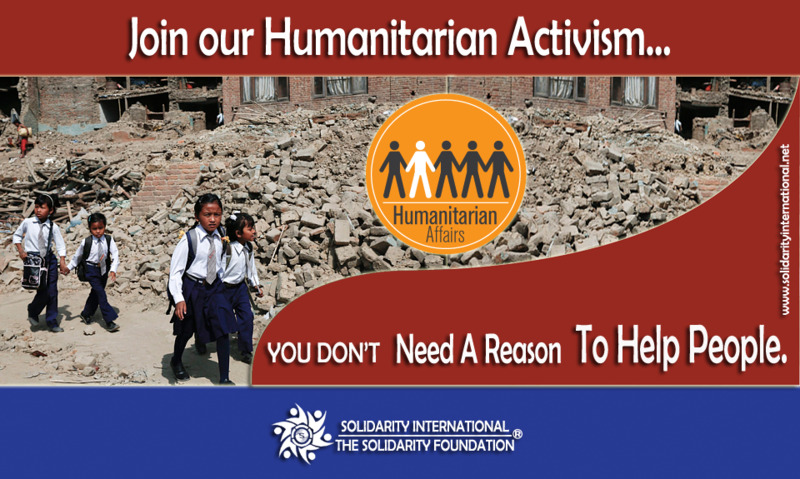 Our organization Solidarity International Nepal too is not the exception to this case. So, with the additional support from Solidarity International USA, Solidarity International Hong Kong, Solidarity International Australia, Solidarity International Canada, Solidarity International Malaysia, Solidarity International UAE and Solidarity International Korea, the national councils of Solidarity International, The global coalition against poverty and inequality. We managed to get some relief materials for the survivors. Likewise few active local organizations in this tremor provided us with medicines and sanitary materials. During the time of projects, we faced difficulties. The risks of getting looted, steep road, restriction of family members to go to earthquake prone areas, were some hindrances we faced at first. Despite, all these we came up with our mission on full swing. What we felt is that, still the villagers thought of getting cured soon if granted with more medicines. Some decided to take the medicine on their will without prescription from doctor. We were amazed to see the innocent faces groomed by the active young generation. We were able to alleviate the acute pain of those survivors. The actions we did finally got up with a smile in the faces of victims in the midst of melancholy. The first relief mission of our organization to the most affected district was very risky. The day was inchoate with hailstorms and thunder. The road was blocked by the landslide but as fast as we can we reached our destination. We were supported by local youth organization (SUK) on the way to our destination. More than 100 families were directly benefitted from relief items in this project. We were able to provide two trucks full of relief materials (rice, dal, salt, peas, and tarpaulin) at this place. The total of 450+ families was granted with these materials. We were not just doing our humanitarian service to the Earthquake victims of remote areas but also to the victims of Earthquake of different children houses and orphanages in Kathmandu. Our team distributed few relief items to the children of Srijansil Children Welfare. Altogether 17 children were benefitted from this project. With the magnificent support from our helping hands, we were able to provide earthquake relief medical camp at the remote place of Bhotechaur. More than 150 individuals were examined and distribution of masks along with soap and sanitary pads were also provided. The team of Solidarity International provided 100 tents, 100 blankets, 100 mats and relief materials. More than 100 families got benefitted from this mission. We organized medical camp as well as relief materials distribution program. The basic food materials rice, dal, salt, peas were provided to 290+ families and 160+ survivors were directly examined on the same day. We consider this project as the most salutary one. Our team conducted medical relief program. We were able to check up 200+ patients. With 6 medical team and 6 volunteers we managed to conduct the earthquake relief camp as well as relief materials distribution program on the remote place of Nuwakot. We were assisted by the local youth network of that VDC. We were able to provide medicines to 150+ victims and also were able to distribute basic relief materials (rice, dal, salt) to 111+ families. More than 100 individuals were treated at Dukuchhap. The medical team and volunteers did their great work to make the project a grand success. The biker’s gang of our organization along with the tipper went there to conduct relief items distribution. Rice, dal, salt, blankets were provided to the victims of that area. Finally, the volunteers did great work from their side to relieve the pain of 150+ families. With the assistance from our volunteers, Solidarity was able to provide health camp at this place. Many children were examined there. More than 150+ individuals were treated. The total of five medical teams along with eleven volunteers finally concluded their work with great success. With the great support from our members we were able to make this Earthquake Relief Medical camp project a grand success. Almost 310+ individuals were treated on a single day. Likewise, 200+ families were distributed with hygiene kits. The earthquake relief medical camp as well as relief materials distribution was organized remote place of Lalitpur. The Earthquake Relief Medical Camp as well as relief materials (mosquito net 250 pcs, Soap, Toothbrush and other relief items) distribution program finally concluded without leaving any stone unturned. The totals of 130+ individuals were examined in medical camp and more than 300+ families were directly benefited from relief items distribution. 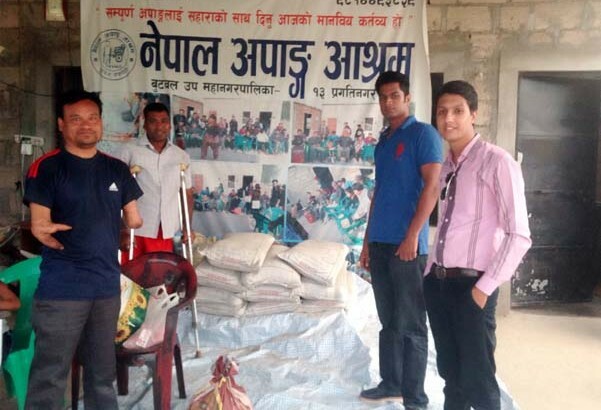 We were success to distribute relief materials which include Rice, Salt and other relief items to 185 families of that village affected by earthquake. The team with the members from visitors from Lebanon did their best volunteerism during the project. We were success to conduct 2 days Medical and Psychological Camp. 700+ patients were treated in 2 days and more than 1000+ children, local youths, parents, teachers and local villagers were benefited by Psychological camp. In almost all of the medical camp we conducted, we saw a gradual increment in blood pressure level than previous. Most of the men in comparison to women had a high blood sugar level. Similarly, our medical camp at Thankot showed the trend high blood pressure in almost every men and women. But in the villages of Dolakha, Nuwakot and Sindhupalchowk the blood pressure of only few people were found high. This shows the unbalanced heath situation in urban than on rural areas. A tendency of sleeping after eating habit is a major factor to this scenario. Likewise, the life expectancy of people in villages is more than the city areas. 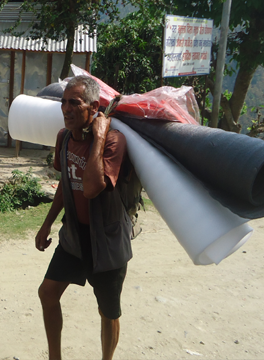 We didn’t saw any octogenarian in urban areas but dozens of what we saw in Dolakha, Nuwakot and Sindhupalchowk. Though much of the destruction occurred in rural areas, the people have not taken much of stress in comparison to urban. The greed, anxiety, worry, irritation, hustle and bustle are some causes that deteriorates the health in urban. One of the most disappointing facts we faced is that some local denizens of capital city though they are prosperous and wealthy were demanding the food. But the locals of Hawa VDC, Dolakha when we requested didn’t demand for food rather they urged us to help in building of the school. We saw a sort of humanity in them. This shows the capital city has been a land of normless and a toxic city filled with noxious behavior. May 15, 2015 – Tokyo, Solidarity International Japan, the national council of Solidarity International and its well-wishers in Japan raised JPY 60,000 for Earthquake Relief Mission initiated by Solidarity International in Nepal. Ms. Indu Gautam – Treasurer, Mr. Dipak Paudyal – Regional Director Asia and Mr. Vishal Khattri – Director Global Fund of SI Global Council were involved to raise fund. The SI Global Council truly appreciates the help made by SI Japan in this very painful moment of Nepal. 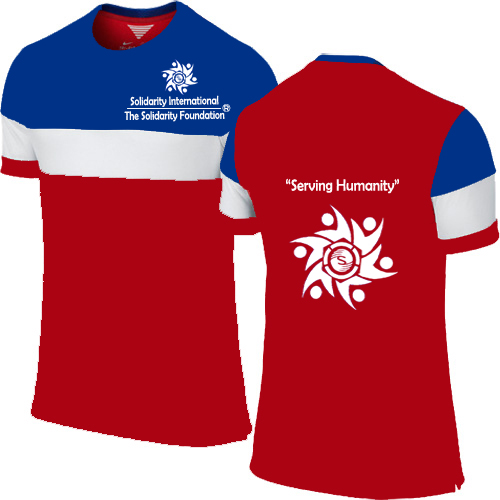 May 10, 2015 – Hong Kong, Solidarity International Hong Kong, the national council of Solidarity International and its well-wishers in Hong Kong raised HKD 15,450 for Earthquake Relief Mission initiated by Solidarity International in Nepal. In various fund raising events organized by SI Hong Kong in leadership of Mr. Incurus Rai, Mr. Bharat Gurung and Ms. Eina Gurung the team were succeed to raise the donation among its members and well-wishers. SI Global Council truly appreciates the help made by each & every donor from Hong Kong in this very sorrowful condition in Nepal. 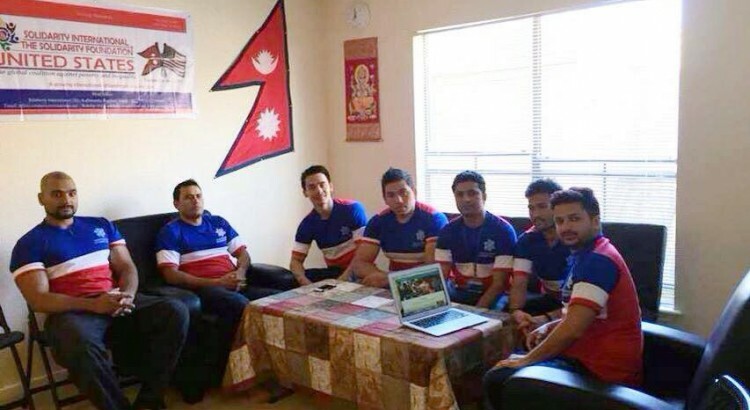 May 7, 2015 – Texas, Solidarity International USA, the national council of Solidarity International, raised US Dollar 2,680 for earthquake relief Mission in Nepal. The members from SI Global Council and National Council USA were directly involved in various fundraising appeal among its members and social contributors. Mr. Jeet Thapa, the active member of SI USA contributed USD 1,055; Ms. Menuka Karki the advisor of SI Global Council contributed USD 1,000 for the relief activities. Similarly, the active members of SI USA Mr. Kamal Kunwar & Mr. Bikram Kunwar donated USD 625 & USD 100 respectively to organize various relief operations in earthquake affected districts of Nepal. Entire villages were flattened and hundreds of thousands of peoples became homeless in Nepal. The tremor of earthquake was felt in Pakistan, India and Bangladesh as well. Massive human casualties, nearly 9000 plus deaths in Nepal and tens of deaths in India and Tibet. The deadly quake was followed by many aftershocks. May 1, 2015 – The owner of Taste of Nepal, A Nepali Restaurant in Adelaide, Australia contributed Australian Dollar 2,650 for the survivors of the recent disastrous earthquake of Nepal. Mr. Kasi Ram Poudel and her wife Mrs. Kamala Poudel contribute the amount for relief mission of Solidarity International. On April 25, 2015 devastating earthquake of 7.8 magnitudes struck Nepal. Over 9000 people died, thousands were injured and many more were left homeless. Mrs. Poudel is also the Advisor of Solidarity International and contributing to various social activism of SI since few years.